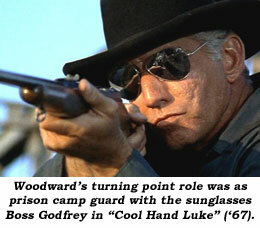 Stern, no nonsense, craggy-faced 6′ 3″ Morgan Woodward’s persona is exemplified by his chilling performance of the mirrored-sunglasses-wearing “man with no eyes” in “Cool Hand Luke” (‘67). But for over 10 years prior to that hit film Woodward had been building on that persona with astonishingly realistic and gritty performances on dozens of TV westerns…and he would continue to do so for many years afterward. 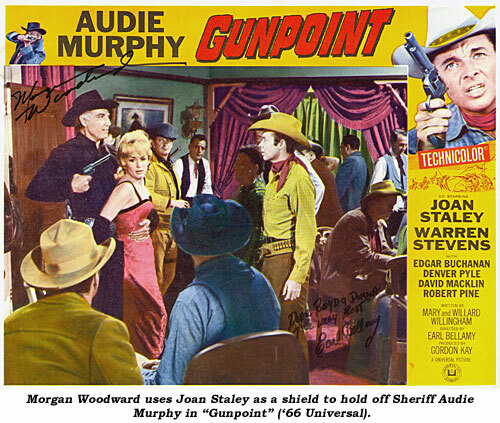 Morgan logged in nearly 160 TV guest star roles (20 on “Gunsmoke” alone—the most for any guest actor) and some 50 films. Thomas Morgan Woodward was born September 16, 1925, in Fort Worth, Texas, the son of Dr. Valin R. and Frances (McKinley) Woodward. His father was one of seven brothers, all of whom were doctors. Morgan’s uncle, Dr. S. A. Woodward, living in the San Angelo, Texas, area, was one day called to deliver a baby. In honor of the doctor’s service, the parents named the child Woodward Maurice Ritter. Later, he was better known as Tex Ritter. Morgan has four brothers, one who is a doctor. Another brother, Lee, was a widely known TV weatherman in Tulsa, Oklahoma. 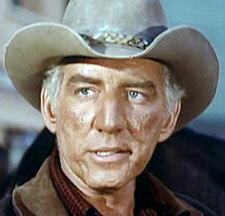 Morgan grew up in Arlington, Texas, where the town has honored him with a street, Morgan Woodward Way. Morgan graduated from Arlington High School where he played football. Upon graduation, Morgan entered the Army Air Corps during WWII. Discharged in December 1945, he enrolled in junior college at Arlington State in January ‘46. Introduced there to theatre, his aspiration was in musical theatre where he sang light opera. He had hopes of joining the Metropolitan Opera, but decided instead to change his major from music and drama. Studying at the University of Texas, he graduated in 1951 with a BBA degree in Corporation Finance. He then attended law school there. All the while, Morgan hosted a variety show on KTMX radio, fronted a dance band and a barbershop quartet. With the outbreak of the Korean War, he was recalled into the Air Force with the Military Air Transport Command, spending two years overseas. Returning home, a job with Lone Star Steel Co. in Dallas as a junior exec was not to Morgan’s liking, so he decided to pursue his ambition of acting and singing. Leaving Texas in ‘55 for Hollywood, an old fraternity brother, Fess Parker, had become a star on Disney’s “Davy Crockett” and opened a few doors for Morgan who soon did three pictures for Disney in rapid succession—“The Great Locomotive Chase”, “Along the Oregon Trail” and “Westward Ho the Wagons”, all in ‘56. It was a lean period for awhile after that, and even though he found some roles on “Zane Grey Theatre”, “Sugarfoot”, “Broken Arrow” and others, Woodward still had to support himself with odd jobs. 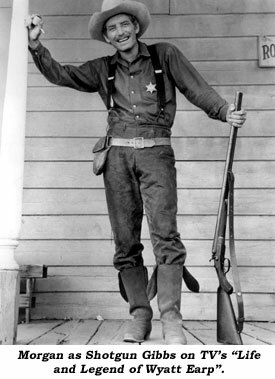 the popular series began) playing frontiersman Shotgun Gibbs, a role that took him through 1961. Then it was back to guest-starring on “Wagon Train”, “Tales of Wells Fargo”, “Rawhide”, “Big Valley” and others until the turning-point role in his career came along in “Cool Hand Luke”. Over the ensuing years Morgan was nominated for three Emmys, two from “Gunsmoke”—“Lobo” (one of his personal favorites), “Vengeance” and “Star Trek: Daggers of the Mind”. In the ‘80s Woodward’s career spiked again as he essayed the role of “Punk” Anderson on “Dallas” and had a 10 month run of the daytime soap “Days of Our Lives” as Phillip Colville.